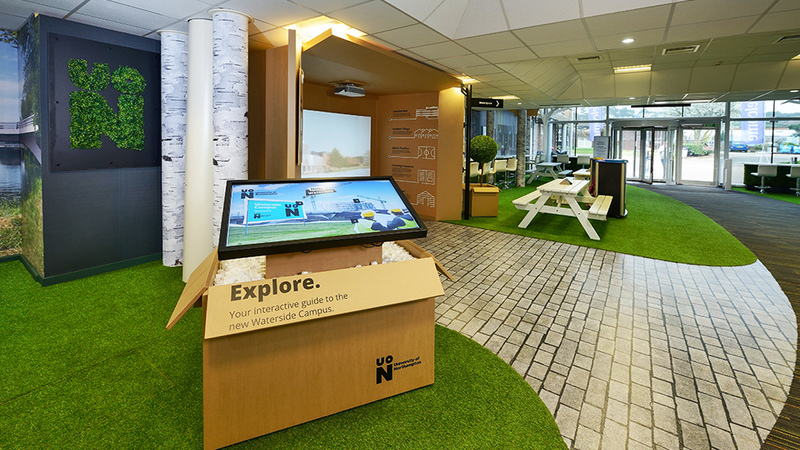 Appealing to three target audiences with three very different objectives, this visitor centre design focuses on the theme “We’ve arrived” by bringing the outside in. 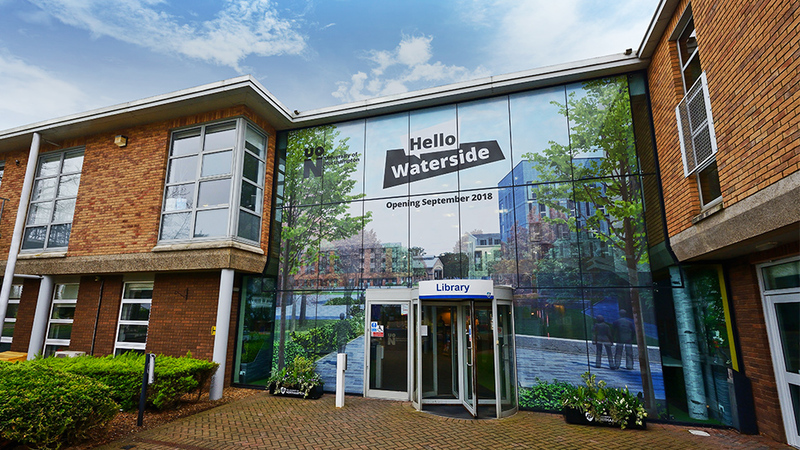 With a vibrant campus that welcomes around 13,000 students, the University of Northampton was moving to its newly-built Waterside campus. The new 58-acre site represents the next stage of UoN’s growth, with updated living and educational facilities that match the expectations of students. 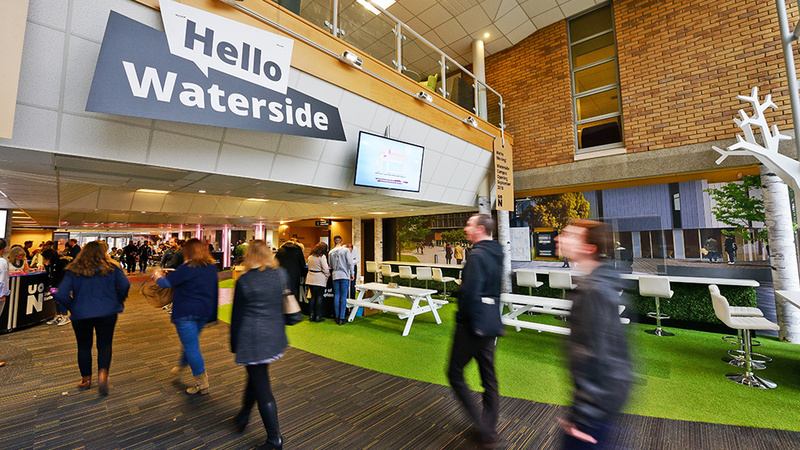 To help promote the Waterside campus, we were asked to create a new design that would drive future enrolment and encourage both current students and staff to embrace the transition to the new location. To deliver a design that would appeal to three primary audiences, each with a very different objective. this audience should see the move as a welcome upgrade to their campus experience, highlighting the University’s investment in facilities and amenities. as an important stakeholder group, this audience should embrace the move, focusing on the positives of relocating, rather than feeling apprehensive about any potential inconvenience or changes to internal systems and processes. to ensure maximum enrolment, the University needed to appeal to students who would be taking their A-levels in the coming year, helping UoN outshine other more established universities in the region. Our Creative Director and Exhibitions team provided two concepts for the Visitor Centre design. UoN loved both and asked us to find a way to combine the two and “bring the outside in”. We presented a hybrid concept that focused on the theme We’ve arrived, while also championing sustainability-conscious aspects of the new campus. 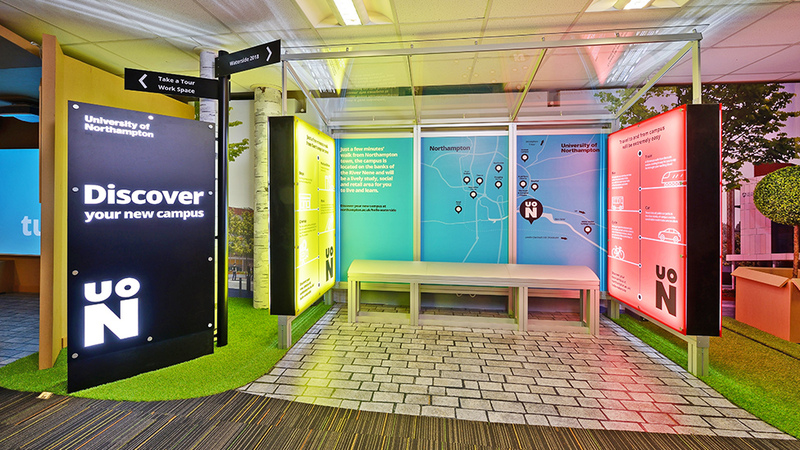 A 9x9m ContraVision one-way graphic was created for each of the two Visitor Centre entrances. This allowed us to brand the exterior windows of the building without restricting the interior view or preventing natural light from filtering into the building. Once inside, the space is divided into three distinct areas: The Build, Campus Life and Location. The Build introduced visitors to plans for the Waterside campus, and progress in construction. It featured two projection booth screens, complete with CGIs of the completed project as well as a 3D model of the finished site. Careful messaging was integrated throughout the Visitor Centre design to address questions and concerns of each of the target audiences. 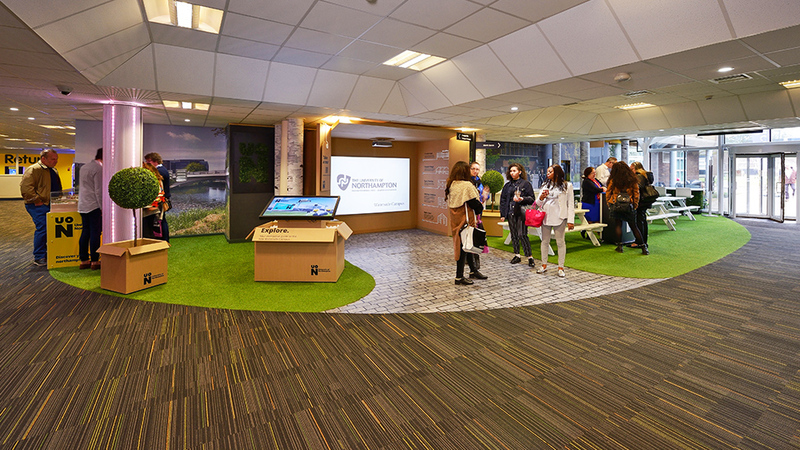 In The Build we brought the outside in by laying down AstroTurf and floor decals, acting as a continuation of on-screen visuals and helping guide visitors through the site. The area also included three full-size picnic tables and a six-seat breakfast bar – all with power for internet access. 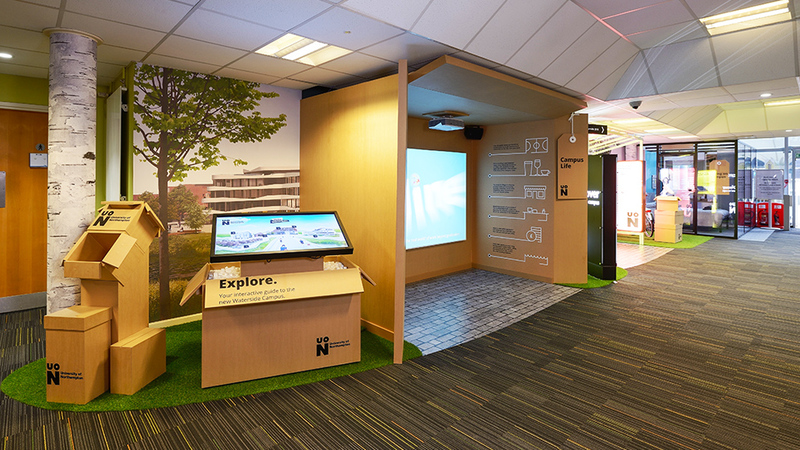 Interactive stations, featuring large touch screens and iPads, were developed for each area. We designed them to look like they were being unpacked from shipping boxes – a nod to the We’ve arrived theme running throughout the experience. To target students, the Campus Life area focused on the amenities and lifestyle options available. Featuring a full-size recreation of a student bedroom, it provided a close-up look at the University’s high-quality accommodation. 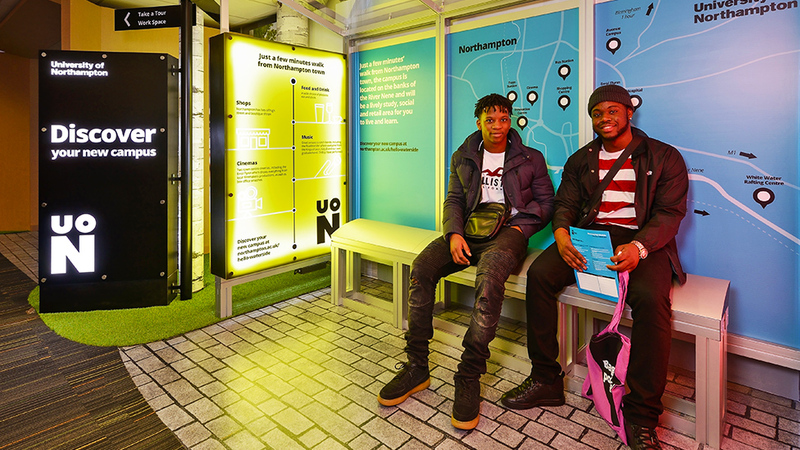 Location helps students familiarise themselves with where the new campus is in relation to Northampton, as well as the various on-site transport options available. 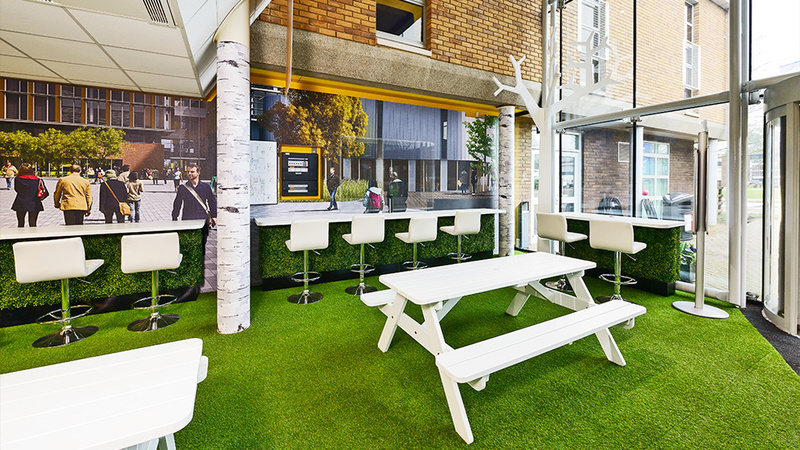 To highlight the more sustainability-conscious ethos of Waterside, Location included a life-size bus stop with backlit posters and maps, as well as a bicycle with information on the campus cycle hire scheme. 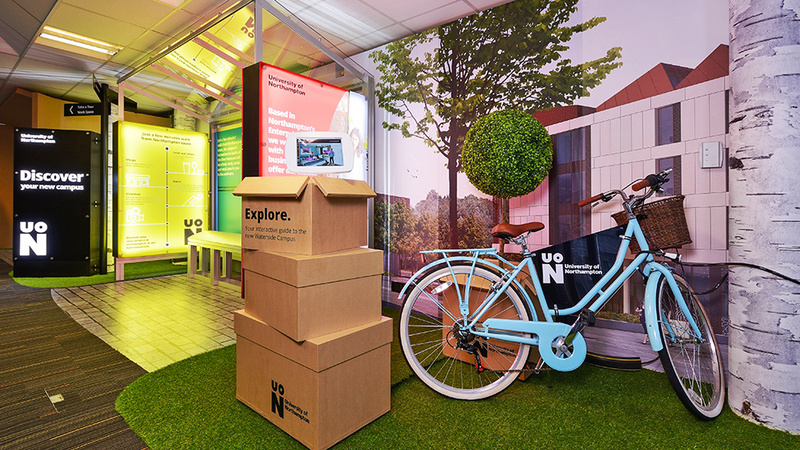 We also created a mini version of the Visitor Centre design with supporting wall graphics at another campus location, a 6x2m UCAS stand design in the same style to provide a mobile experience that could be easily installed at a variety of events, and two 2x1m twist system exhibition stands to support teams at smaller Higher Education events. Extremely well received by students and staff, our client was thrilled with the result. We also received feedback that the mobile stand was a hit at UCAS events, making it easy for recruitment teams to attract students.